Bosch's pictures have always fascinated viewers, but in earlier centuries it was widely assumed that his diabolic scenes were intended merely to amuse or titillate, most people regarded him as "the inventor of monsters and chimeras." Philip II, though, collected his works more for education than for entertainment. A Dutch art historian in the early 17th century described Bosch's paintings chiefly as "wondrous and strange fantasies" often less pleasant than gruesome to look at'. 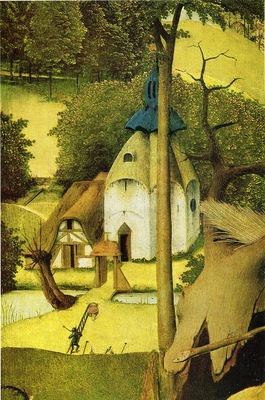 In the 20th century, however, scholars decided that Bosch's art has a more profound significance, and there have been many attempts to explain its origins and meaning. Some writers saw him as a sort of 15th century surrealist and linked his name with that of Salvator Dali. For others, Bosch's art reflects mysterious practices of the Middle Ages. No matter what explanation and comprehension of his art might be, Bosch remains the most extravagant painter of his time.